When the Titanic was being built, Royal Crown Derby was commissioned by the White Star Line to produce china for the Titanic’s First Class à la carte restaurant. The Titanic was the largest passenger steamship when it was launched in May 1911 and the exclusive order was for 600 dinner plates, 150 soup bowls, 150 breakfast plates, 100 salad plates, 150 breakfast cups and saucers and 100 teacups and saucers. 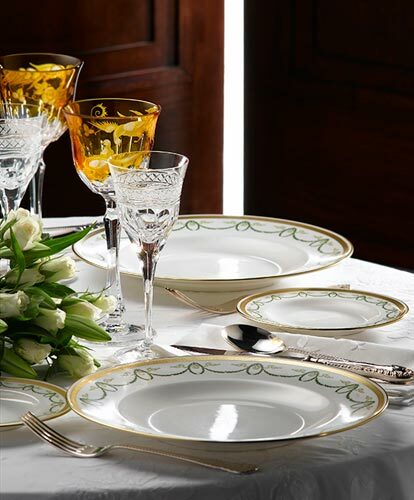 Royal Crown Derby’s classic design for the Titanic restaurant featured a green wreath and incorporated the older style OSNC (Ocean Steam Navigation Company) logo rather than the White Star flag. Only one plate survived the fateful Titanic voyage and is now in Southampton Museum. For the first time since 1911 Royal Crown Derby has now put the Titanic range back into full production. And to commemorate the 100th anniversary of the launch of the Titanic, the bone china manufacturer is holding a Titanic exhibition which starts on February 26th. The centrepiece of the exhibition will be a recreation of the First Class à la carte restaurant with a table laid as it would have been on the fateful 1912 voyage. The exhibition will also include memorabilia from the Titanic, as well as from its sister ship the Olympic. Visitors will also be able to see the costumes worn by Kate Winslett and Leonardo DiCaprio in the 1997 movie. Royal Crown Derby Visitor Centre, a 15-minute walk from the centre of Derby, has a factory shop, a coffee shop and a museum. Factory tours are available at 11.30 am and 1 pm Tue–Fri, booking essential. The Titanic exhibition runs from 26 February to 2 July, 2011. Opening times are 10:00 – 17:00 Mon–Sat, 10:00 – 16:00 Sun. Admission is £5 adults, £3 children, £15 family ticket.